31st May 2014 – World Championship bronze medalist Hellen Obiri (KEN) continued her stellar form with another outstanding display at the Prefontaine Diamond League meeting. Competing in the 1500m on this occasion Obiri followed the good pace passing through 800m in 2:08. The lead changed hands several times as pacemakers dropped out and first World Championship silver medalist Jenny Simpson and then World Champion Abeba Aregawi hit the front. 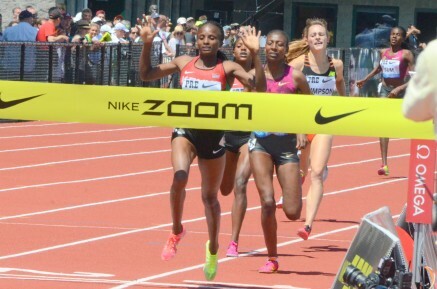 Neither move was decisive though and Obiri burst to the front to take the win in a 2014 world leading, an American All-Comers record and new personal best 3:57.05. Obiri now holds the 2014 world leading times in both the 1500m and 3000m and is particularly fond of the Prefontaine meeting having also won here in a personal best time last year! The night after Galen Rupp (USA) had set a new American Record over 10,000m, Shannon Rowbury (USA) followed suit but in the 2 miles. Rowbury thought she had a shot at the record coming into the race but had to work hard over the final 100m to dip inside the old mark of 9:21.35 and set new figures of 9:20.25. This gave Rowbury 4th place in a competitive race that also saw Jordan Hasay (USA) run a PB of 9:35.05 for 9th. Another Nike Oregon Project athlete to set a PB was World Championship silver medalist Matthew Centrowitz (USA). In the strongest mile field assembled for some time, Centrowitz picked his way through over the final 400m to take 8th place in 3:50.53. He was closely followed by Bethwel Birgen (KEN) in 10th in 3:51.12. There were also season best performances for Andrew Osagie (GBR) in the mens 800m, and Jemma Simpson (GBR) in the womens B 800m. In Bottrup, Chris Tomlinson (GBR) stepped up a gear in his 2014 campaign as he sailed over 8 metres for the first this season, taking victory with a leap of 8.23m. Dina Asher-Smith (GBR) also recorded another victory running 11.21 for the 100m at the Bedford International Games. Rhys Williams (GBR) won the Welsh 400m hurdles title in 50.00. Finally, on a weekend of strong performances by PACE athletes, at the JAAA’s All-Comers meet in Kingston World Championships 100m 4th placer Kemar Bailey-Cole (JAM) improved his season’s best to 10.16 secs with Kimmari Roach (JAM) clocking 10.22 secs and Mario Forsythe (JAM) close behind with 10.36 secs.